There is one common challenge which parents find themselves facing. With classes becoming more and more complex, it’s difficult to keep up with your child’s homework, let alone understand the level of questions they are expected to answer during an exam. However, just because you can’t understand trigonometry doesn’t mean that you can’t help your child prepare for their trigonometry exam. If this sounds like a position you find yourself in, The Tutoring Center, Santa Clara, CA is here to help. The post below includes a range of tips which all parents can adopt to help their student prepare for an upcoming exam. As much as your student may tell you that sugary foods and drinks keep them awake and able to study longer, the reality is that these foods only cause short-term energy bursts which result in their energy levels crashing shortly after. Further, there aren’t any nutrients in these food items which are needed to help their brain retain the lessons they just learned. From cooking them healthy meals and ensuring they sit to eat them to preparing healthy brain-fueling snacks which they can enjoy during their study sessions, do what you can to help keep their brain fueled and ready to learn. Despite what your student’s teacher tells them about staying up all night and missing out on sleep to pull ‘all-nighters,’ students continue to do it, thinking that sleep is just lost study time. However, the truth is that without sleep, their brain won’t ever get a chance to process the lessons learned and convert them into recallable memory. Work with your student to plan out their study schedule to allow sufficient time for them to get a solid amount of sleep each night. 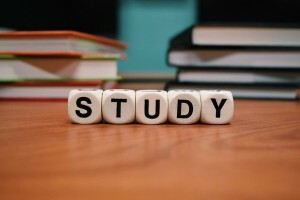 Doing this can boost the effectiveness of their study periods as they will wake up with a memory filled with the lessons they learned the night before which will be more easily recalled during exam time. On the subject of making time to sleep, during periods of extensive studying, consider lowering the number of chores your child needs to perform each day and week. Of course, chores are a great lesson in responsibility and should be maintained throughout the school year, but consider lightening their load to allow for extra study time or, as mentioned above, enough time to sleep. If you adopt this tip, be sure that your student knows that, when the exam period is over, their chores will return so that they don’t become accustomed to a life without chores and struggle to fall back into their regular routine. If your child needs more study help than you can provide, tutoring can fill in the gap. To learn more about how one-to-one tutoring can benefit your child and help them achieve higher grades on both their exams and report cards, speak with a learning professional today. Call The Tutoring Center, Santa Clara, CA at (408) 816-7825 and book your free initial diagnostic assessment where a trained tutor can answer any questions you have about the benefits of one-to-one tutoring in Santa Clara, CA. No matter what your child tells you, exams don’t just appear out of nowhere without any prior warning. In fact, it’s likely that their teacher gave them an exam schedule closer to the start of the school year. Make time to sit with your student and, using a calendar or a planner, plan out which days and at what times your student will study for each exam. This method allows you both to easily see whether they will have enough time or whether changes to their routines need to be made. If your child doesn’t know when their exams are, speak with their teacher or even the school administrator to find out. A really great way to help reinforce lessons recently learned is for your student to act as the teacher and for you to take the place of the student. After each of their study sessions, sit down and have them give you a brief rundown of what they have just studied. If possible, ask questions which require them to recall more information learned. Even if you have no idea what they are talking about, you will be surprised by just how beneficial this task is for reinforcing their lessons and committing them to recallable memory. Whether your student wants help raising last year’s C to an A+ or there is an upcoming exam on a subject which they are struggling with, tutoring in Santa Clara, CA can help. To book your free initial diagnostic assessment where you can learn more about the benefits of one-to-one tutoring, speak with a trained learning professional at The Tutoring Center, Santa Clara, CA today by calling (408) 816-7825.